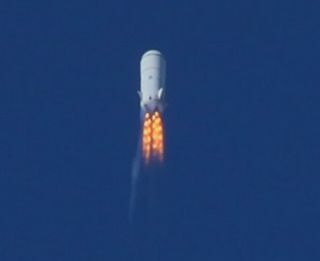 Blue Origin's second test vehicle, a suborbital launch vehicle, soars through Mach 1.2 at 45,000 feet in this image released by the secretive private spaceflight company. This image was taken in August 2011 right before the thrust termination system activated, resulting in the loss of the vehicle, company officials said. Blue Origin, the private entrepreneurial space group backed by Amazon.com mogul Jeff Bezos, has reported a failure in its suborbital rocket development plans. "Three months ago, we successfully flew our second test vehicle in a short hop mission, and then last week we lost the vehicle during a developmental test at Mach 1.2 and an altitude of 45,000 feet," Bezos wrote in a statement posted to the Blue Origin website today (Sept. 2). "Not the outcome any of us wanted, but we're signed up for this to be hard, and the Blue Origin team is doing an outstanding job. We're already working on our next development vehicle," Bezos reported. This view of Blue Origin's second test space vehicle shows the suborbital rocket during a successful summer 2011 "short hop" test flight, according to company officials. The tight-lipped Blue Origin space company has been focused on suborbital spaceflight, first using its Goddard vehicle and then migrating to the New Shepard spacecraft design at its facility in Culberson County, Texas. New Shepard is seen by the company as supporting the commercial suborbital tourist market. The Goddard vehicle flew a on a short, successful test flight in November 2006. In April 2011, NASA awarded Blue Origin $22 million in funding under the space agency's Commercial Crew Development (CCDev) program for development of concepts and technologies to support future human spaceflight operations. That award followed $3.7 million in funding the company received in 2010 to develop an astronaut escape system and space capsule for ground tests. NASA retired its space shuttle fleet in July and plans to rely on U.S. commercial spacecraft like those being developed by Blue Origin and other private space companies to transport American astronauts to low-Earth orbit. While the test vehicle that failed last week was a suborbital vehicle, Blue Origin is also developing an orbital space capsule designed initially to launch on an expendable Atlas 5 rocket, then transition to a reusable booster being developed by the company. "In case you’re curious and wondering 'where is the crew capsule,' the development vehicle doesn't have a crew capsule … just a close-out fairing instead," Bezos added in a postscript to his website update. "We're working on the sub-orbital crew capsule separately, as well as an orbital crew vehicle to support NASA’s Commercial Crew program." Apparently undaunted by the rocket failure, Bezos ended his report with: "Gradatim Ferociter!" That's Latin for "Step-by-Step, Ferociously."